At the risk of belaboring this point…Mother Nature’s seasonal dial seems to be stuck between Winter and Spring. The Sierra forecast for this weekend was for 15 inches of new snow. It would be all well and good if this were not early June. As in almost summer. As in I’m tired of the cold and rain. My northern California neighbors would understand. But we’re slaves to Nature’s whims, are we not, so we may as well go with the flow. I abandoned my grilling plans and replaced them with time on the stove for a big pot of soup. Not a brothy, summery soup but a hearty, filling one with a potatoes. Normally, I would have thrown leeks into the mix but since I was in refrigerator clean-up mode, I used broccoli florets, celery, onions and shallots. With extra time granted by rainy weather, I chopped all my leftover onions and shallots and caramelized them for 30 – 45 minutes to bring out their sweetness and deepen their flavor. The result was a rich, brown base that eliminated the need for much enhancement to the stock. In fact, I used only a 32-ounce container of chicken stock for the big pot I made, water made up the rest of the liquid. I puréed the soup once all the vegetables were tender and added only 1/4 cup of cream to finish. Garnished with bacon, sprinkled with a bit of cheese and served with baguette slices, I didn’t mind so much sitting in front of the fire on this cold, June day. * Use this as a guide. These are approximate measurements. Feel free to use whatever you have in the refrigerator like I did. In a large pot, heat a few tablespoons of olive oil over medium heat then add the onions and shallots. Cook for at least thirty minutes over moderate heat until they are nicely caramelized. Stir occasionally. Add the celery and cook for five to eight minutes. Season with salt and pepper. Add the chicken stock, scrape the caramelized bits at the bottom of the pan, bring to a boil and add the potatoes. There should be enough liquid to cover the potatoes but if not, just add water. Simmer until the potatoes are fork tender. Add the broccoli florets and add enough water to cover them in the pot. Bring back to a boil and cook until they are also tender. At this point, if you feel you need more flavor in the soup, add your favorite no-salt seasoning blend. Purée the soup (I use a stick blender). Add a dash or two of curry powder to the puréed soup to brighten the flavors even more. You won’t need too much. Serve in bowls with desired accompaniments. I *do* understand! I sometimes worry that to non-California friends I sound like a broken record, whining of how I’m tired of winter, but I just am! I’m tired of jeans and closed toe shoes. Give me my flip flops, gosh darn it! But at least there are cozy days to enjoy soup like this. It sounds lovely and comforting. We had an indoor weekend, too, and truthfully, it was much needed, after a busy several weeks. Hope the sun starts to shine soon, though. great soup recipe. and i can totally relate to your frustrations with mother nature’s seemingly crazy seasonal dial… it snowed yesterday not too far from where i was visiting this weekend. so looking forward to picnic-friendly weather! This looks yummy! I’m originally from Australia so June IS winter for me, and this kind of soup would be exactly what I’d be eating this time of year. Love your photos and blog! 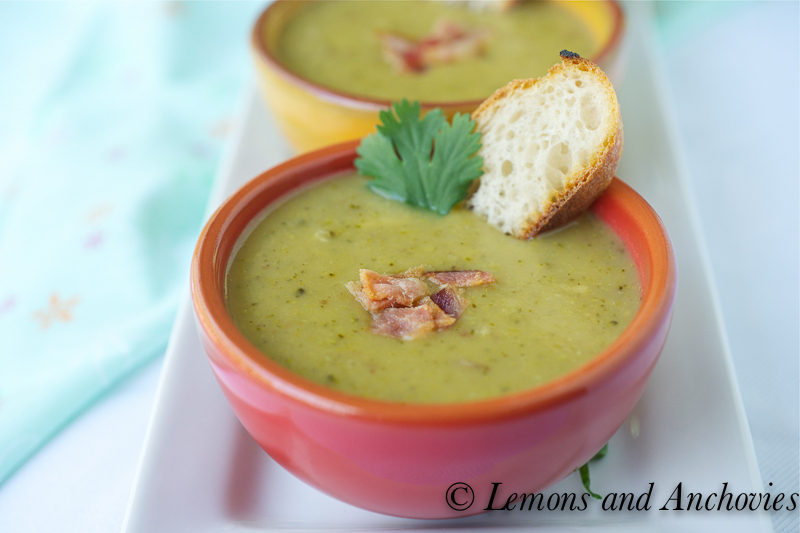 Hearty Potato Broccoli soup …. Lovely Clicks !! I loved that you used what you had in the refrigerator. This soups looks delicious. I hope your California weather returns to normal soon. On the east coast, we always assume it is sunny and warm in California! 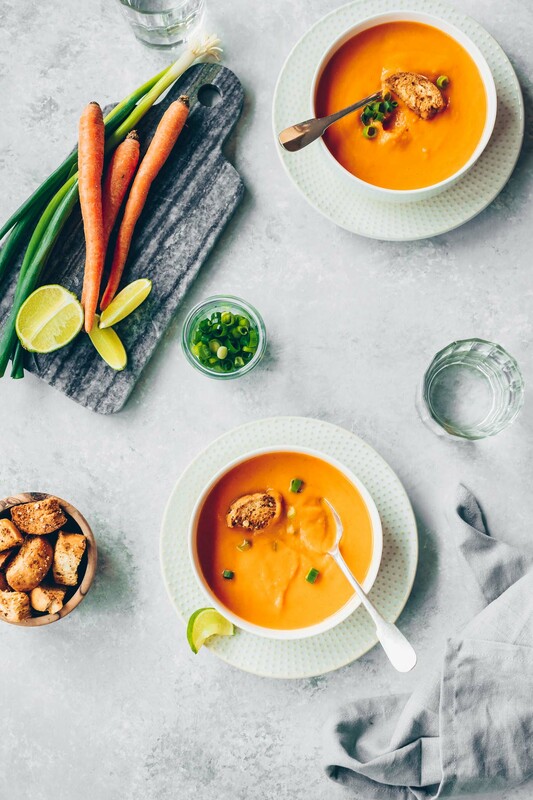 Unfortunately temps are about to shoot up to the 90s here this week so hot soup isn’t the first thing I’d think to eat, but goodness…you make soup look luxurious! I’d just sit in my apartment with the AC cranked up so I could eat this. Hope some of our East Coast heat travels over to you guys. I’d rather be bundled up than sweating through my outfit every day! 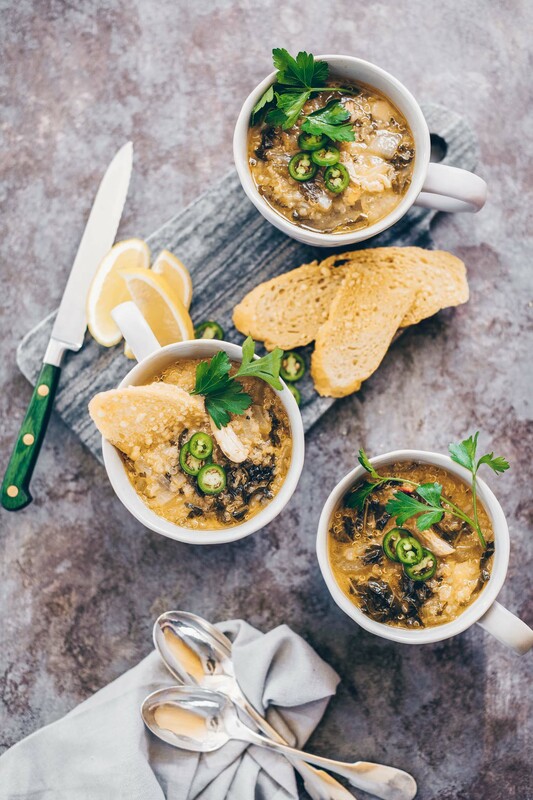 Sounds like a flavorful soup – love how you caramelized the onions and shallots to add depth, and I also like curry in my soups! Being here during this cold/rainy period… I can honestly say there is nothing more that I want than a big bowl of soup. And this looks like it would totally hit the spot. I could not imagine getting snow in early June! I don’t know how you people deal with that! Regardless, this soup looks delicious! Jean, this looks SO GOOD. I already bookmarked this. I know the weather has been so cold and rainy…but it’s true we can appreciate this kind of warm soup just one more time before having summer weather. Or who knows we might end up with a few weeks instead of once. >_< Happy Monday! I can’t imagine sitting by the fire in June! 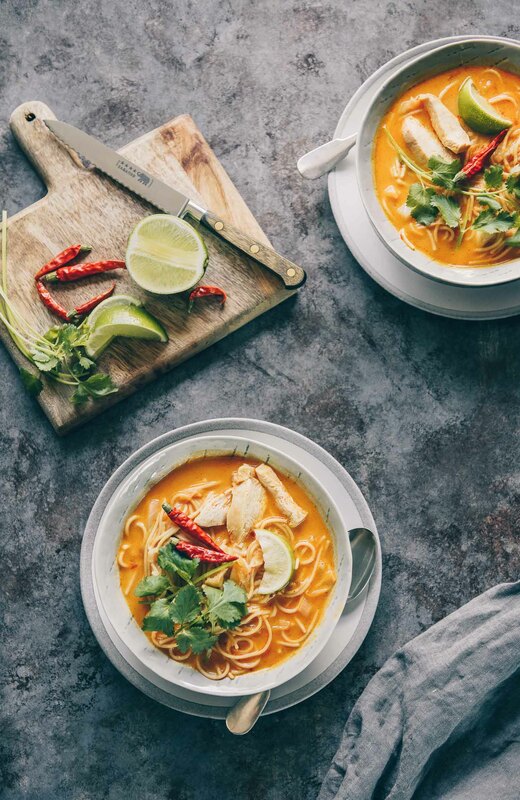 I think we need to switch locales for a day or two 🙂 I live in Phoenix and it’s unbearably hot by this time of year…a cool, dreary days sounds nice, especially because it would give me an opportunity to enjoy this soup! Yeah, what’s wrong with this weather?! I will be on holiday in two weeks, I hope I won’t have rainy holidays. 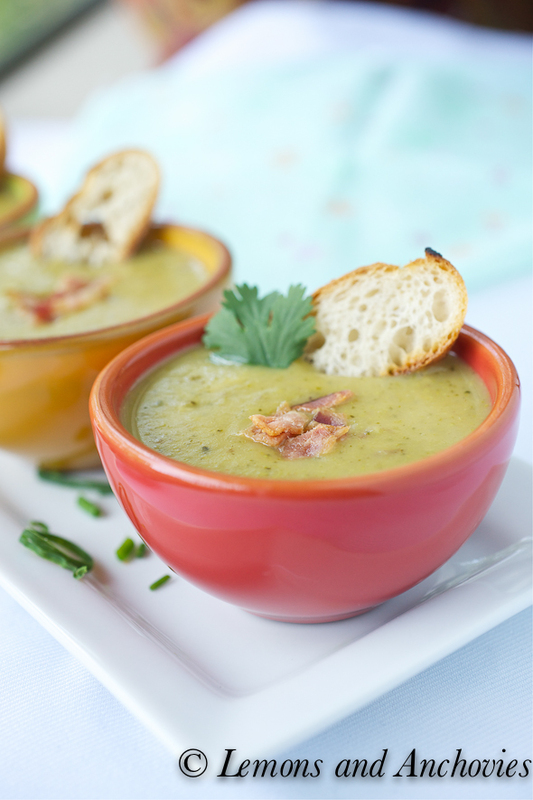 In the meantime, I could totally go for this soup! I love that you used what you had in the fridge! Looks tasty and I think the photos are great too! That soup looks gorgeous. What beautiful photos. I could have used a bowl of that soup last Saturday too! This is my very favorite kind of soup – vegetables, a potato or two, broth, puree, eat! The weather’s been a little strange down in Southern California too, it goes from hot to cold and rainy almost overnight. Regardless, I can always go for a nice bowl of soup like this. I was imagining savoring this soup! Yum! Wonderful for this weather too. Love your soup recipe Jean! Awesome presentation as always! so sorry to hear about the crazy weather you’re dealing with. hope the sun will come out soon. 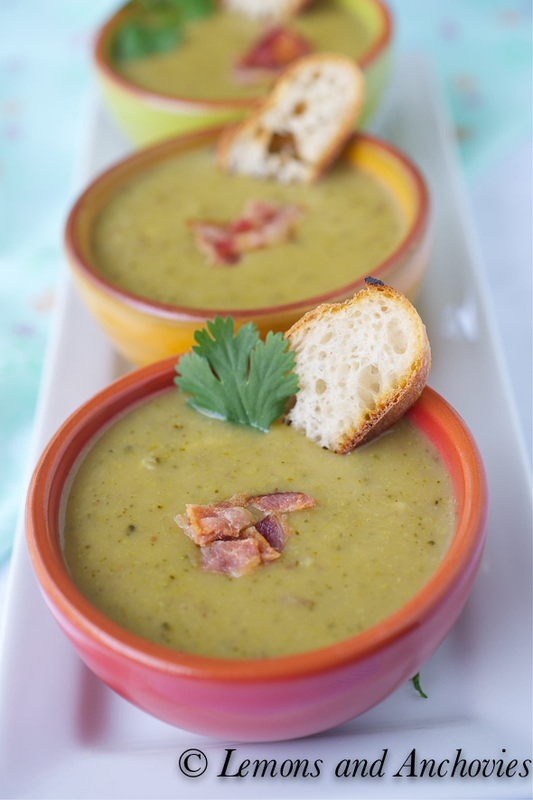 Sorry to hear of your continued bad weather but the soup looks like the perfect cure! I haven’t made broccoli soup in over 10 years. I really should make some… yours looks really delicious. 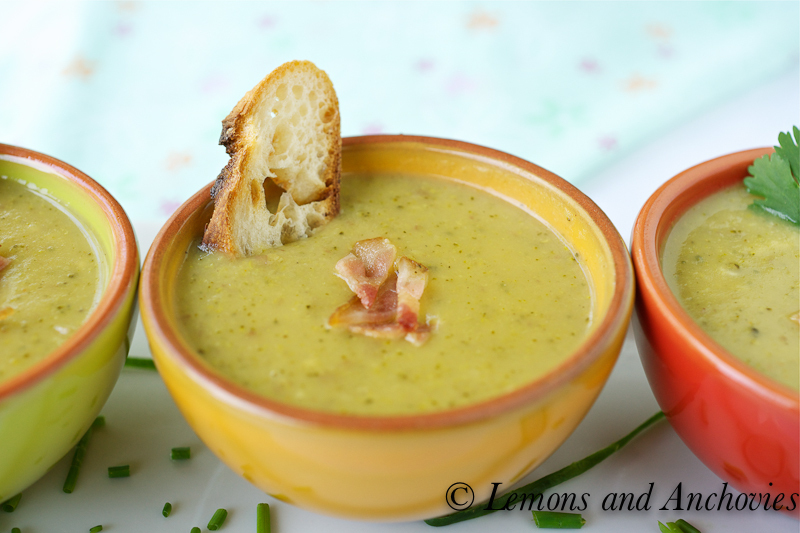 I love a good creamy broccoli soup! We’re having cool and overcast weather down in SoCal today and it definitely makes me crave soup. Hope you guys have better weather soon! How do you think this would be as a cold soup? With the weather bouncing like a big rubber ball that versatility would make this a Perfect Soup!!! I understand! Just sent out a post about grilling in the rain. What happened to summer? Soup looks fab! I LOVE potato broccoli soup! It is so satisfying, right? And the flavors are unique veggie flavors that I just enjoy. I hope the Nor Cal weather has gotten better since this posting! I looked at the 10-day forecast here in Orange County and the weather’s in the mid-70s. I’m not trying to rub it in that I hate it in the mid-70s. I’ve not been to Nor Cal (save for San Francisco) so, I don’t know the weather that you are/were experience but would love to!!!! I’ll trade your cool days with my hot days. Maybe I should be living in Oregon or Washington? Hahaha. Hope your summer’s going lovely so far! Delicious! We made this tonight and since we didn’t have any cream, we used a dollop of plain greek yogurt… very yummy. Fantastic recipe! Thank you so much! Cori, I’m so glad you liked the soup. Thanks so much for taking the time to come back and comment about it–much appreciated, thank you! Happy Holidays to you and your family!